One of the most desirable map of Ireland for collectors. Based on the map of Boazio, published by J. B. Vrients in Antwerp between 1608 and 1612. Antique map of Southeast Asia. Printed in Antwerp by Gielis van Diest in 1570. Historical map of Israel, Canaan with the Wanderings of Abraham. Printed around 1595 in Antwerp. Abraham Ortelius: Chinae, olim Sinarum Regionis, nova descriptio. Auctore Ludovico Georgio. Old coloured map of China. Printed in Antwerp by A. Ortelius circa 1587. Old coloured map of Siberia, Moscow. Printed in Antwerp in the year 1584. Old coloured map of Ireland. Printed in Antwerp by Christoffel Plantin in 1580 or 1589. Coloured map of Priest Joan, Ethiopia, Central Africa. Printed in Antwerp by Jan Baptist Vrients in 1603. Old coloured map of Djerba, Elba, Corfu, Sicily, Sardinia, Malta. Printed in Antwerp in the year 1587. Old coloured map of Djerba, Elba, Corfu, Sicily, Sardinia, Malta. Printed in Antwerp in the year 1584. Abraham Ortelius: Thusciae Descriptio Auctore Hieronymo Bellarmato. Old coloured map of the Tuscany. Printed in Antwerp in the year 1584. Abraham Ortelius: Candia Insula / Archipelagi Insularum Aliquot Descrip. Old coloured map of the Aegean Sea, Cyclades, Crete. Printed in Antwerp in the year 1584. Old coloured map of Palestine, Israel. Printed in Antwerp in the year 1584. Coloured map of the Persian Gulf, Caspian Sea, Iran. Printed in Antwerp by Plantin Press in 1595. Old coloured map of the Low Countries with Belgium and the Netherlands. Printed in Antwerp by Gillis van den Rade in 1575. 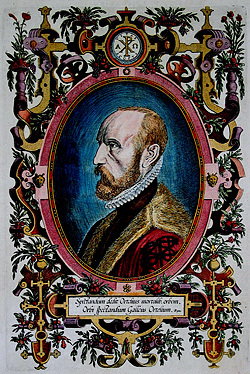 Abraham Ortelius: Lutzenburgen sis Ducatus Veriss. Descript. Iacobo Surhonio Montano auctore. Lutzenburgen sis Ducatus Veriss. Descript. Iacobo Surhonio Montano auctore. Old coloured map of Luxembourg. Printed in Antwerp by Jan Baptist Vrients in 1603. Old coloured map of Udine, Rome, Lake Como. Printed in Antwerp in the year 1584. Coloured map of North Rhine-Westphalia, Lower Saxony. Printed in Antwerp by A. Ortelius in 1588. Coloured map of Germany. Printed in Antwerp by A. Ortelius in 1572. Nice original old coloured map of Corsica, part of Tuscany around Siena and the Ancona region by Abraham Ortelius. From the 1584 Latin edition of Theatrum Orbis Terrarum , Latin text on verso. Old coloured map of Baden-Württemberg. Printed in Antwerp by A. Ortelius in 1579. Old coloured map of Schleswig-Holstein, Lower Saxony. Printed in Antwerp by A. Ortelius in 1603. Old coloured map of Southern Italy, Napoli. Printed in Antwerp in the year 1584.